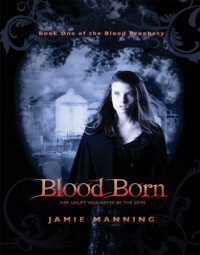 I for one am glad to see more vampire books popping up again, especially with the scary blood-thirsty kind of vampires found in Jamie Manning’s Blood Born. Blood Born is the first book in the Blood Prophecy Trilogy and is about a girl named Ava who wakes up in a coffin underground to find she’s been reborn a vampire. Good thing she has Chance, the boy who dug her out of the grave, to help her. But a new vampire is not the safest person to be around if you know what I mean. All Ava has to do to get out of her dire predicament is kill 100 vampires and she’ll be human again. Part Vampire Diaries and Buffy the Vampire Slayer; Blood Born is scary and fun.There’s a lot of mystery and secrets surrounding Ava’s new vampire existence. She has no memory about her past life at all. Since this is the first book in a series, there are hints about Ava and the other vampire players to whet your appetite, but we are in the dark along with Ava for the most part. 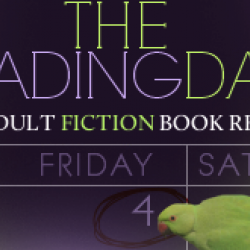 Ava seems like a normal high school student, but when the fangs come out—watch out. Ava has a great sense of humor though, and I was rooting for her to be strong and hold on to her humanity.The romance is really well done, and Ava and Chance have a lot of potential. And it doesn’t seem like there’s a love triangle, so thank goodness for that. Chance is a great guy, but he has secrets of his own to keep things interesting. I am very curious to see where their relationship goes in the sequel.Ava has her own Scooby gang of vampire hunters to help her in her quest. It is a different twist to have a vampire bond with vampire hunters but Ava can use all the help she can get. The fighting and action are exciting and Manning is fearless in putting his characters in danger. There is death and mayhem, and when it’s all over you will be craving the sequel like a newborn vampire craves blood.Blood Born is witty, action packed, fun, surprising and romantic. And it’s not too scary to read only during during the day, though there is definitely some bloodshed. Recommended for YA paranormal romance fans, this is an enjoyable quick read sure to please those looking for a fresh vampire tale. Bring on the sequel.